CS: Welcome to Camilla Stein Review, Nolyn. Madison County is a very recent Hollywood horror movie with a classic intrigue. Tell us how you became involved in this project? 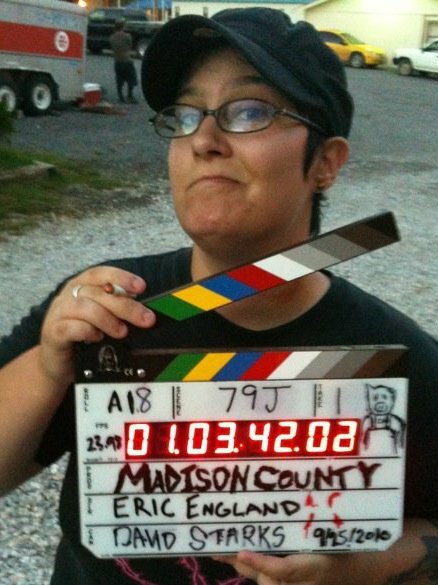 Nolyn Hill: I was actually just browsing around on the Internet for film jobs, and stumbled upon Madison County which is indeed a horror film, set and filmed in the actual county of Madison in Arkansas, not too far from my hometown. They were looking for a Camera Assistant, so I emailed them and heard back from them a few weeks later. I was originally hired as the second AC (assistant camera) but then throughout the show I ended up being the DIT (digital imaging tech) and Production Assistant. CS: What were your exact tasks as one of the crew of Madison County? Nolyn Hill: As the DIT, I worked with the camera operator/dp, 1st and 2nd AC’s, and the script supervisor to watch for continuity, correct lighting, and all around aspects of making the shot look good. Tracking movements and such. And as a PA I always drove to pick up the cast and crew lunch, I would also drive people to and from set and wherever else they needed to go. I also made trips for the costume department. CS: We don’t hear that side of the story too often, the one that sheds light on what it really takes to make everything look on screen the way the director wants it. Have you been able to fully integrate your professional experience and your passion for your craft into your performance in this function? Nolyn Hill: Indeed and yes! I learned so much from working on MC. I am currently in pre-production for a couple of films (a short, and a full length) as a producer, which I am very excited. The short story I actually wrote myself and plan on shooting sometime this winter (when it’s actually not 115 degrees here in Arizona) and probably sometime next year I will be the Director of Photography on a new ghost type movie. CS: Sounds great! Keep us in the loop on those projects. Now, what I always wanted to know, what distinguishes the set of a horror movie from any other? 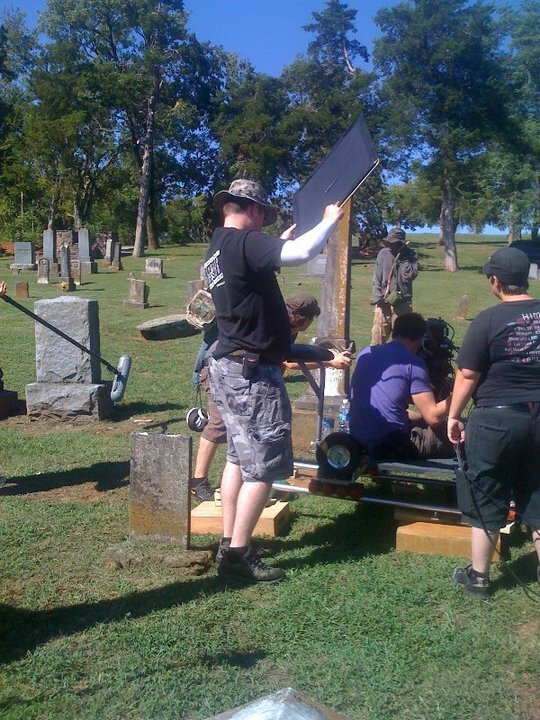 How would you describe a typical day on the set of Madison County? Nolyn Hill: The gore, for sure. Ha-ha. We would usually start around 5-6 am, get to the set and have a huddle about what everyone needed to start doing to set up the first shot. Coffee was a MUST in the morning. We would make sure that everyone was doing something and preparing for all of the next shots. Many of the shots we did over and over and over again, to get different angles and such. 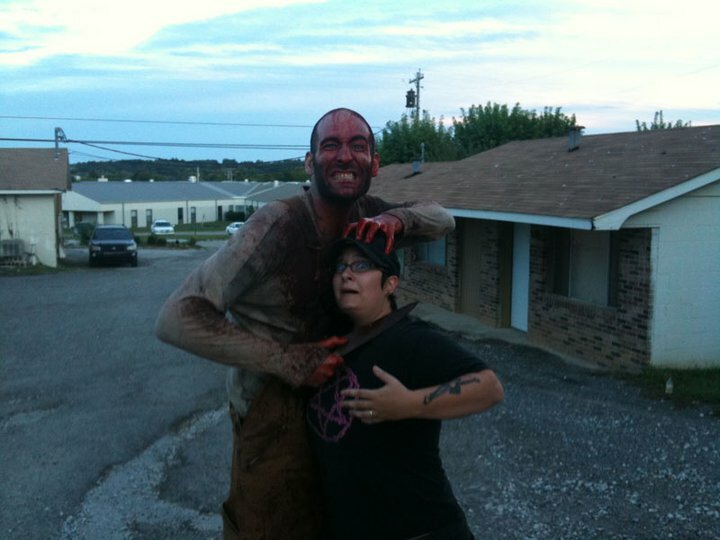 But only towards the end of the shoot was when we started shooting the actual kill and bloody scenes. We had an amazing SFX artist from the awesome “Almost Human” SFX studio from Hollywood, Ca. We used everything from fake heads, legs, and even cat litter with blood to simulate some stabbing. It was very interesting and really cool to figure out how all of those bloody scary scenes work out. It was really cool being behind the camera and then being sprayed with blood as our killer was taking the lives of one of his victims. CS: That’s a pretty picture, no doubt. So, there’s lots of fake blood while filming, lots of emotion and excitement. Was it distracting? Nolyn Hill: Most of the time, no. But Nick Principe who played our killer Damien was awesome to work with, so it was very strange to be sitting there with him hanging out, and then see him put on that really scary pig mask and chase these kids around the woods and such. There was only really one scene that actually freaked me out, and I’m sure it will you too when you see it, but most of the time we were just focusing on getting the shot, so there’s not a lot of time to get excited or anything, but every now and again sometime would come up that was very creepy and kind of scary to even watch. CS: He looks bloody scary! Sounds like you all had a lot of fun. What was the most memorable event during shooting? Nolyn Hill: There was a chase scene that we were filming where one of our actors, Colley Bailey (playing James in the film) was running on a very narrow concrete bridge from some random man in a truck following him literally on his tail. Colley was running as fast as he could, and then he would jump onto a pad just off screen. We were all a little on edge, but we made sure that everything was perfectly safe, and no one would have the chance of getting hurt. Well, we did about five takes, and by this time Colley was getting a little tired. The next shot, I pulled out my phone to film it as well just for friends and such. Colley comes running across the bridge with the truck right on his tail, and just before he goes to jump to the mat, he slipped on some loose gravel and nearly fell down right in front of the truck. If he would have fallen all the way, he would have been run over and probably killed, but he quickly lunged out of the way and narrowly missed being hit by the truck. All of us dropped our things and quit filming and ran over to make sure he was okay. He was perfectly fine, just a little shaken up from the slip. CS: Good no one was injured, indeed. What was the most challenging part of your job on the set? Nolyn Hill: The hours. I mean, one day we left our motel at 5 am, drove for 3 hours to get to the remote location, and then spent the entire day out in the hot sun, and we didn’t wrap filming for that night until 11:30 pm, then another three hour drive back to the motel. 12+ hours was the norm for each day, and we only got four days off throughout the 20-days shoot. It was a lot of physical work, and it definitely made me gain a whole new respect for all the hard work of not only the crew, but the actors as well. Everyone worked their nails off and did a really great job, so it was all worth it; you make a lot of good friends and really learn a lot. CS: Would you do it again? Nolyn Hill: Most definitely. I am always willing to work on a picture. I’d do it every day if I could! CS: Wishing you much luck with that, Nolyn. Thank you for talking to CSReview.